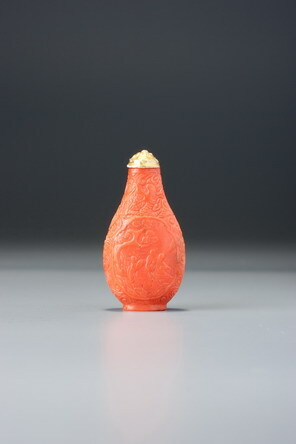 This snuff bottle probably dates from the Yongzheng or early Qianlong period, although we have left a broader dating range to allow for it being earlier, which is by no means out of the question. It is of lovely colour and delightful workmanship and must rank as one of the great coral snuff bottles, and certainly as one of the rarest. Although it would accord, materially, formally, and stylistically with what we know to have been court taste of the eighteenth century, the dragon in the clouds has only four claws. Four-clawed dragons are unequivocally not for the emperor, but that does not preclude imperial manufacture. Vast numbers of bottles were made by the court to be distributed as gifts, and since most of those granted the use of the dragon in its four-clawed variety, there is no reason why imperial workshops should not have made bottles as gifts to courtiers. Another imperial link is the form, which may be taken from the field of ceramics. 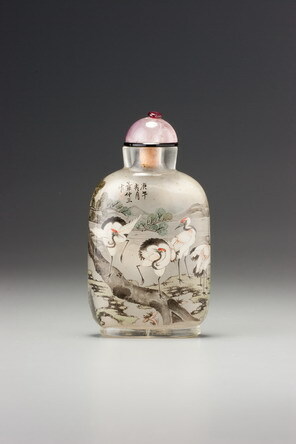 It is of somewhat similar appearance to the exquisite and also very small imperial enamelled glass bottle in the J & J Collection (Moss, Graham, and Tsang 1993, no. 186), which can be dated to the first two decades of the Qianlong period and is definitely from the palace workshops. Both are decorated with panels of figure subjects, and are of this general shape, although the enamelled bottle has a flared neck and slightly higher shoulders. The last factor in favour of an imperial attribution, and possibly one to the palace workshops, is the exaggerated depth of foot left in the hollowing, which is otherwise unusually extensive for a coral bottle. This is what we would expect in a bottle designed for display (as a sign of imperial favour), for the heavier foot provides some measure of stability. These small bottles do not fit so comfortably in the hand; they are too small and delicate. They may fit between the fingers, but in the palm of the hand, where a normal-sized bottle is comfortable and, in most cases, sensuously tactile, they are usually too delicate and fragile to feel comfortable.